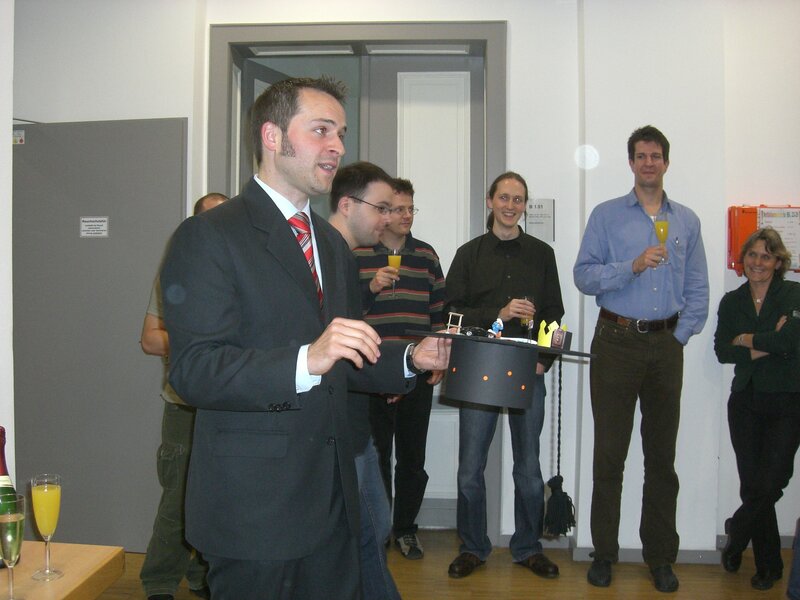 After the defense, I hosted a small party where a lot of friends, family, and colleagues attended. The following two pictures were taken during the party. This picture shows me explaining the elements of my Ph.D. head. The Ph.D. head was created by my colleagues and they gave to me as present. The head is super cool and it contains many elements characterizing me and my (research) work. Special thanks to my colleagues for this lovely head. 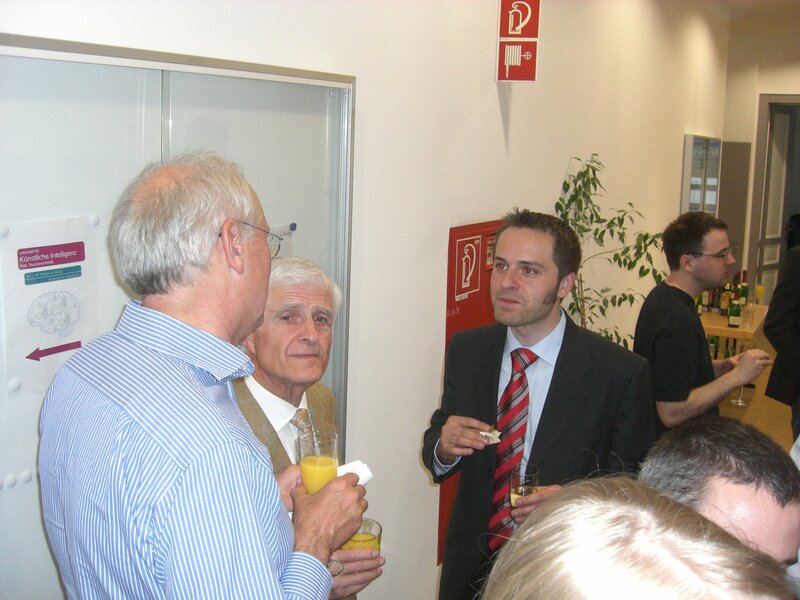 Prof. Effelsberg, my father and me in discussion. Special thanks also to my friends who helped me preparing the party and cleaning up afterwards. Today, I released (JSTUN 0.7.3. The major change is that the Simple Logging Facade (SLF4J) has been added. This allows application developers to integrate the logging output of JSTUN to the logging framework of their choice. This work has been initiated and mainly crafted out by Jeff Williams. So, special thanks go to Jeff. Besides the SLF4J changes, only minor improvements (e.g., typos) have been added. I attended the 14th Euro-IX forum in Prague where I gave a presentation about "Peakflow + jsFlow: A Working Solution for Large IXs" and I chaired the security workshop. Both my presentation and the workshop went pretty well. You can see both recorded here. This Euro-IX forum was the second Euro-IX forum I was attending. As last time, it was of a great pleasure for me to meet all these people who run Internet exchanges all over the world. I had a lot of fruitful discussion with many of them. For me as a bloody beginner in the field of Internet exchanges it is great to learn from so many experienced and well-educated people. The next Euro-IX forum will be held in Rom and the chances are good that I am going to attend this one as well. I am really looking forward to it. jsFlow is a Java library for sFlow v5. Currently, it supports all headers that are supported by Force10 E-1200 switches. Force10 E-1200 switches support only a sub-set of the headers that are specified in the sFlow specification. So, if you want use the jsFlow library with any other device than a Force10 E-1200 switch it might be the case that jsFlow does not support all headers coming from your device. However, as jsFlow is designed to be extensible it should be easy to add missing headers. jSflow is released under the GPLv2 and can be downloaded here. As I have been implementing jsFlow for a internal project at DE-CIX I am happy that the management of DE-CIX supported my wish to open-source jsFlow. The current version of jsFlow is 0.1 indicating that a lot of work has to be done in order to get a full-fledged sFlow library. So, please feel to contribute to jsFlow. I will be happily accept patches that fix a bug or add new features!